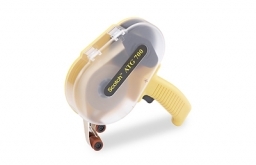 Description: Use this adapter kit for Scotch ATG700 Adhesive Applicator when you need the flexibility of a ¼" inch wide application. 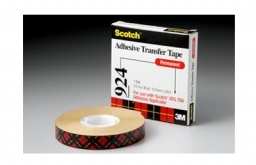 Description: Yellow adhesive applicator for use with Scotch ATG (Adhesive Transfer) Tape ½" or ¾" inch wide rolls. Touch of the finger triggers quick, controlled application of tape. No mess or clean-up. Saves time and effort. 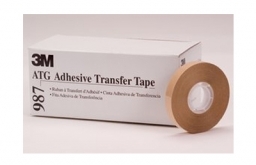 Applies adhesive transfer tape while simultaneously removing and rewinding the liner. Covered gears minimizes applicator jams. Transparent cover shows remaining tape. Holds up to 60 yd (55m) of Scotch ATG Tapes. 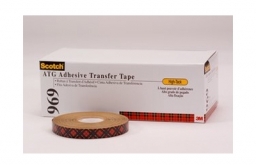 Description: 1.7 mil general purpose adhesive transfer tape used for holding many paper, foils, films, and various foams. 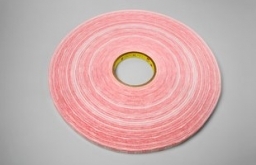 Standard Widths: ¼", ½", ¾"
Description: 2.0 mil adhesive transfer tape ideal for bonding materials with glossy coatings where an aggressive adhesive with high initial adhesion is desired. Some application ideas are: folders and boxes, attach fabric swatches in sample books ideal for bonding a wide variety of similar and dissimilar materials such as metals, glass, wood, papers, paints, and many plastics, mounting promotional items, posters, etc., Core starting, and mounting picture frame mat boards and dust covers, assemble point-of-purchase displays. Standard Widths: ¼", ½", ¾" & 2"
Description: 5.0 mil high tack ideal for bonding materials with glossy coatings where an aggressive adhesive with high initial adhesion is desired. Some application ideas are: folders and boxes, attach fabric swatches in sample books, assemble point-of-purchase displays. Description: 2.0 mil ideal for bonding together a wide variety of similar and dissimilar materials such as metals, glass, wood, papers, paints, and many plastics. Medium-firm acrylic pressure-sensitive adhesive system with an excellent balance of high initial adhesion (quick stick) and good shear holding power. 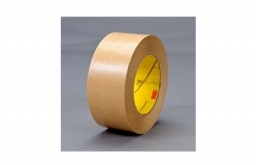 Standard Widths: ¼", ½", ¾", 1" & 2"
Description: 1.0 mil, general purpose, extended-liner pressure sensitive 400 acrylic adhesive transfer tape with a densified kraft paper liner. Uses include pharmaceutical outsert attachment, general paper attachment, and for applications requiring a thinner liner. Use to seal flaps on poly-bags and envelopes. Pressure sensitive edging on business forms, literature, photos, posters, and labels. Standard Widths: ½", ¾” & 1"